Egg Foo Yung is a Chinese egg omelet. The name is Cantonese and means "hibiscus egg." Egg Foo Yung (also spelled Egg Foo Young and Egg Fu Yung) is made with beaten eggs and most often ham, but--as with the omelet we are all familiar with--a variety of meats and seafood as well as vegetables can also be added. What makes it distinct from the French omelet is that Egg Foo Yung is often served with a brown sauce. 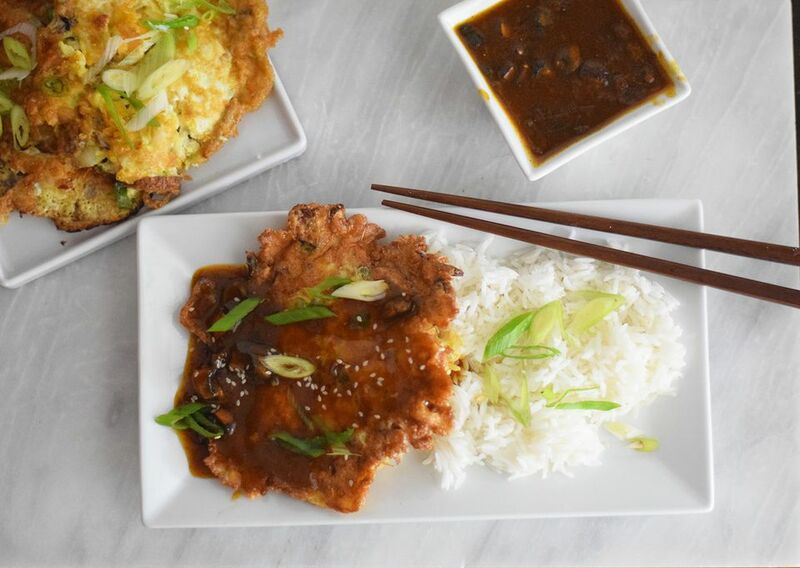 While Egg Foo Yung was born in American Chinese restaurants in the mid-1800s, its inspiration likely comes from Shanghai cuisine. Fu Yung Egg Slices is an elaborate Shanghai recipe made with beaten egg whites and minced ham, possibly named for the lotus flower. A northern Chinese version replaces the ham with a minced chicken breast. From these dishes came the Egg Foo Yung some of us may remember enjoying in Chinese-American restaurants throughout the 1950s and 1960s--a deep-fried pancake filled with eggs, vegetables, and meat or seafood. Today, homemade Egg Foo Yung is normally pan-fried instead. Lightly beat the eggs, but not enough so that bubbles form. Thinly slice the meat and vegetables for more even cooking. To coax more flavor out of the vegetables, blanch or stir-fry before adding to the egg mixture, even if the recipe doesn't call for it. Make sure the blanched vegetables are well drained. Do not add the other ingredients to the egg in the pan. Instead, mix them with the egg before cooking. Make sure the pan is hot enough so that the egg mixture cooks properly. Form the eggs into small pancakes or one large pancake. For extra flavor, prepare a sauce: Egg Foo Yung is one of the few Chinese dishes where a sauce is prepared separately and served over it. The brown sauce that frequently accompanies beef with broccoli works well with this dish. If making a sauce, prepare it first and keep warm while cooking the Egg Foo Yung. All of these recipes have a simple accompanying sauce/gravy that is easy to make and delicious with the omelet, but you can leave it out if you wish. Stir-fried Egg Foo Yung is a hearty dish with Chinese sausage (lop cheong) and vegetables. In this recipe for restaurant-style Egg Fu Yung, the Egg Fu Yung is deep-fried, giving it a light and airy texture. For the option of deep- or pan-frying, the author of this Egg Foo Yung recipe shows you how to use the same ingredients to cook the omelet either way.